This Dell Inspiron E1705 had so many issues when it came to us. 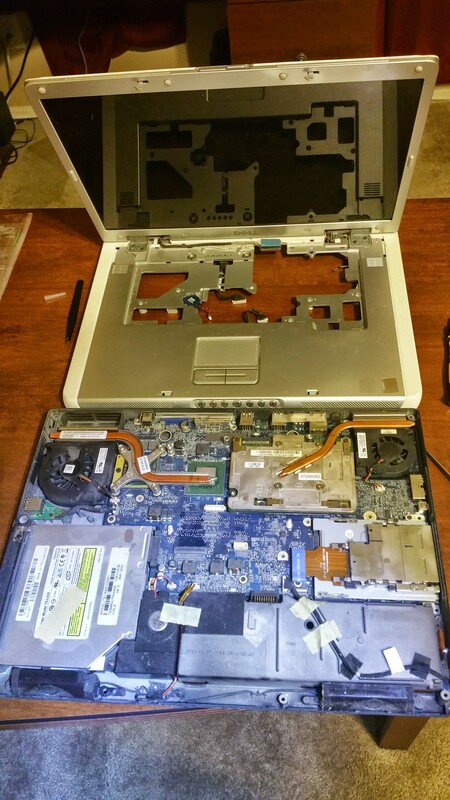 The customer knows the laptop is old and he should probably just replace it with a new laptop. We think the sentimental value is more than the value of the laptop itself. The laptop was overheating and shutting down to protect itself. We found that the CPU fan failed and was no longer spinning. We decided to replace the CPU and GPU at the same time as well as the BIOS battery. The parts were less than $10 total. After we replaced the parts we dealt with the operating system and software updates. The customer purchased Windows 7 from Discount Mountain Software and had a legitimate license key. Unfortunately, the company sent the wrong media download link and the wrong version of Windows 7 was installed by the customer and the would not activate. The company is ranked “F” at the BBB and were completely unresponsive to any requests we made via email and phone. Fortunately, we had the correct media that matched his purchased license key. We were able to reinstall the OS and get it activated with Microsoft to get all the security updates available. The computer is in “as-good-as-new” condition and the customer is very happy with it. A solid state hard drive would be the next step to restoring this laptop to faster than new conditions. What old laptops do you have sitting around that are ready to be revived?